Pantone announced the 2017 color of the year, “Greenery”, and we are obsessed. A new year marks new beginnings, and here we’ve come up with a number of different ways for you to rock this fabulous shade. From a bold printed dress to a small pop of color in a piece of jewelry, there’s a way for everyone to sport this striking earthy shade in a way that will make people green with envy. A bold printed dress like this is perfect for the coming spring season. The beautiful green shades pop among the bright purple and grey, offering a look with flourish and style. A dress with hints of the green shade offers a perfect way to sport the shade in a subtle yet chic way. Versace Collection, Floral printed dress, $895. A bright green wing or swipe of shadow is a way to make a bold statement. All eyes will be on you when wearing this statement hue. This look can go from everyday with a bright-colored wing, or to a fun night out with this fun shadow. Urban Decay, Razor sharp water-resistant longwear liquid eyeliner in Kush-grass green, $22. Makeup Forever, Aqua cream satin finish in acid green, $23. You’ll be in style all the time with this adorable watermelon phone case. The fruit is a fun print that adds a hint of playfulness to the bright green, and makes it so you’re always sporting the hottest color of the year. Prada, Watermelon saffiano leather iPhone 6 case, $185. A colorblock skirt like this offers just a hint of the shade with a little “peek-a-boo” panel on the side. This offers a little splash of the green and allows you to play with other colors for a fun, lively look. The panels allow for the color to be shown of in a little sashay, giving a flirtatious vibe that is full of style. A cute pair of earrings like this allows you to sport the color in a calmer, more everyday way. A splash of color offers a little attitude, while still remaining posh. This is an easy way to add the color to your outfit and enhance the look; you’ll be sure to charm everyone with a cute piece like this. Kendra Scott, Alex drop earrings, $55. This skirt offers a dramatic way of sporting the color, and can be dressed up or down depending on the occasion. Paired with heels and a blazer, it’s a perfect way to make a spring statement in the office. If worn with a bold graphic tee and sneakers, it can go from dressy to sporty. This skirt is a great versatile piece to add to your closet to rock the color of the year. Mary Katrantzou, Crovis flower embroidery wool skirt, $870. A bold statement clutch like this offers a bright addition to any outfit. Make this piece the center of your outfit by pairing it with a neutral dress and ankle booties. It’s no doubt this flirty clutch will be the bright accent piece of any outfit. 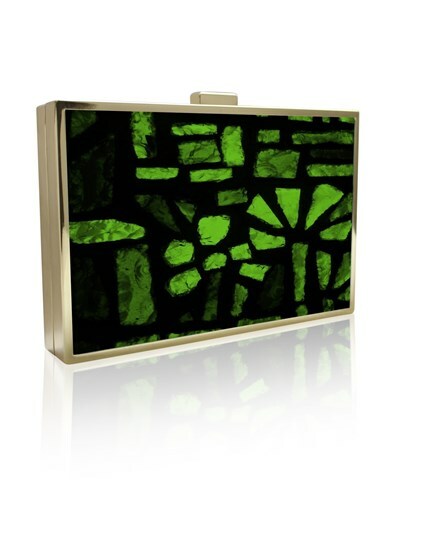 Kamilah Willacy, Stained glass art evening clutch in green, $375. Whether you’re on a fun winter cruise, or lucky enough to live where you have a warm beach year round, a bright retro swimsuit like this is the perfect way to rock the color! It’s a bright statement that is sure to let others know you’re not afraid to stand out. Lauren Ralph Lauren, Beach cutout swimsuit, $104. You’ll never be late on trends with a gorgeous watch like this. A bright band is a perfect way to add a pop of color to your wrist and accentuate your entire outfit. This petite piece is without a doubt the perfect way to add a subtle pop to your everyday look. Dior, ‘La Mini D de Dior Diamond’ stainless steel & gradient patent leather strap watch, $4500. Wave hello with this bright flirty polish! All eyes will be on you with this vibrant shade, making you the attention of all. This polish a great way to rock the beautiful shade, making others green with envy over your mani.